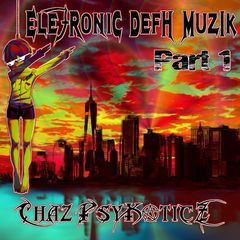 Ele7ronic Defh Muzik is the 11th Demo by Chaz PsyKoticz. Also marking his first project (to be) released in 2 Parts. Part 1 of this Mixtape was publicly released on April 1st, 2019 as a single track on Soundcloud. CHECK BACK HERE OR CYBER STALK ME ON SOME OF MY FAVORITE OR ALL SOCIAL MEDIA SITES AND KNOW THE MOMENT PART 2 IS RELEASED MID APRIL!!! ...as the Subject Title to get a FREE Digital Copy of this Demo. – An Email Confirmation will be sent over to you. – If you want this mix to come in a Single Track Format, go to my SoundCloud and Download it. - PART 2 WILL AUTOMATICALLY EMAILED TO YOU A DAY OR TWO AFTER IT'S RELEASE!!! – 2 Multi-Track "Ele7ronic Defh Muzik" Demo CD's. – Hand-Drawn Artwork on CD Case. – Alternatively a Single Track Format can be ordered. – As well as a Special Quad Disk Demo with 2 Multi-Track Format Discs, & 2 Single Track Format Disks, for $10 that comes with a bonus material. – If you would like a Hardcopy Demo with Hand-Drawn Artwork contact info@chazisgod.com about this demo and more. – This Demo is 1 for $5, 2 for $8, and 5 for $15 (unless specified otherwise). – All costs cover Shipping, Labor, Artwork and Supplies. – Hand-Drawn Artwork (look, & color) itself may vary. - You can order the same demo, or any other one in place of 2 Demos in 5 for $10 Deal. – Check Each Demo, for their Individual Features.